It’s May 2008, and we (Ian & Marianne) have just returned from the Scottish Bongo Bash, north of Fort William, a day earlier than anticipated due to a medical emergency. As you can see from the picture above, Marianne’s face has been entirely destroyed by the wee midges (that don’t come out until July, we were reliably informed). But it wasn’t all doom and gloom. The site, Linnhe Lochside Holiday Park is managed by “Woody”, a fellow Bongo owner, and is in a spectacular setting just off the “road to the isles”, about 6 miles NW of Fort William. The facilities are top notch, and the 30 Bongos and their occupants were made very welcome. The pitches are all on hard standing, and awnings had to be erected using steel pegs. Fortunately, there was little wind to blow the awnings down if you had forgotten your heavy duty pegs. …….walking on the beach admiring the scenery…. …….or driving to the white sand beaches at Arisaig (which Henderson and Brandy loved). On the way back, we saw a very rare sight, Ben Nevis without any clouds! 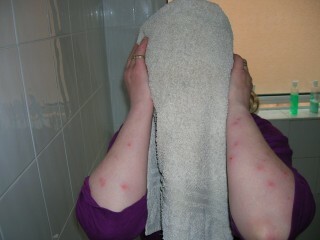 Ofcourse, warm weather means the midges come out in the evenings, and although some people dined “al-fresco” without any problems…..
….for others, it was hell on earth! Still, if we venture that way again, you may not recognise me, because I may take some additional safeguards!